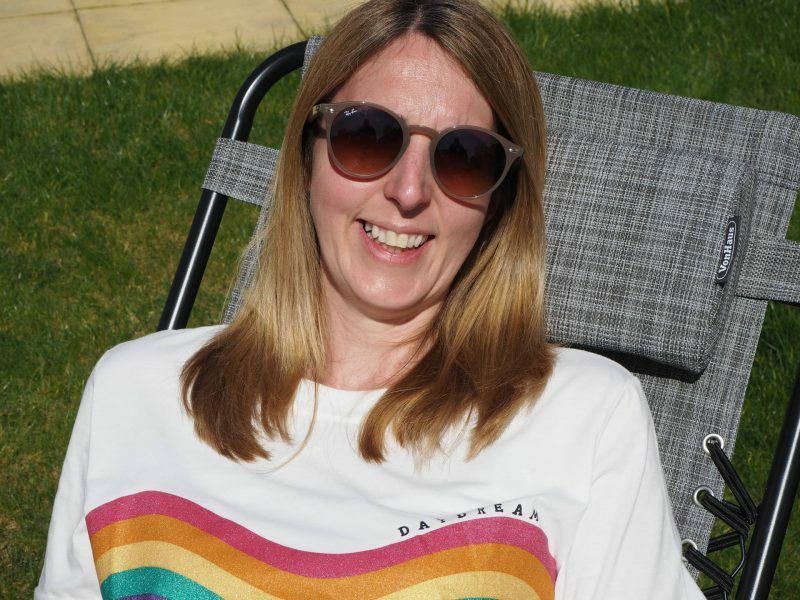 We had our first taste of summer last week and it was really nice to feel the sunshine, after what has felt like a long winter. 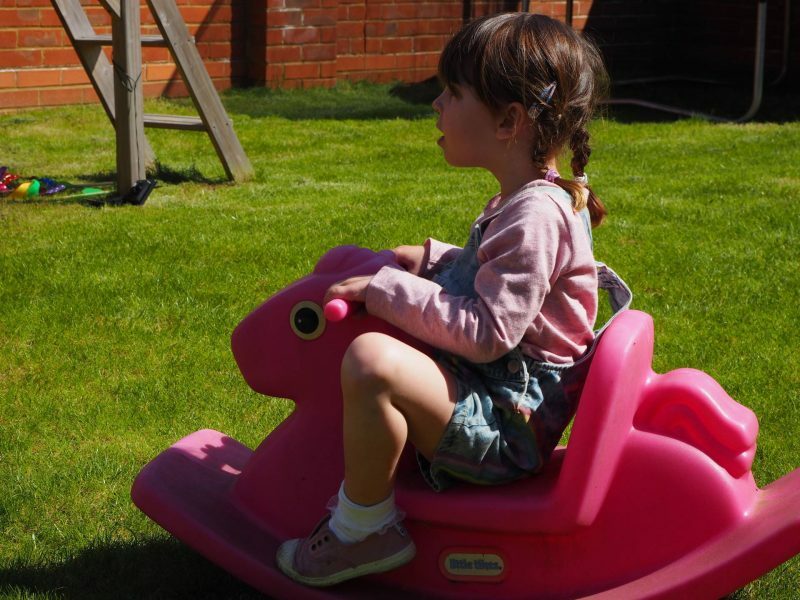 My girls love to be outdoors whatever the weather, but when the sunny days and the lighter evenings arrive there is more opportunity for them to be out in the garden. 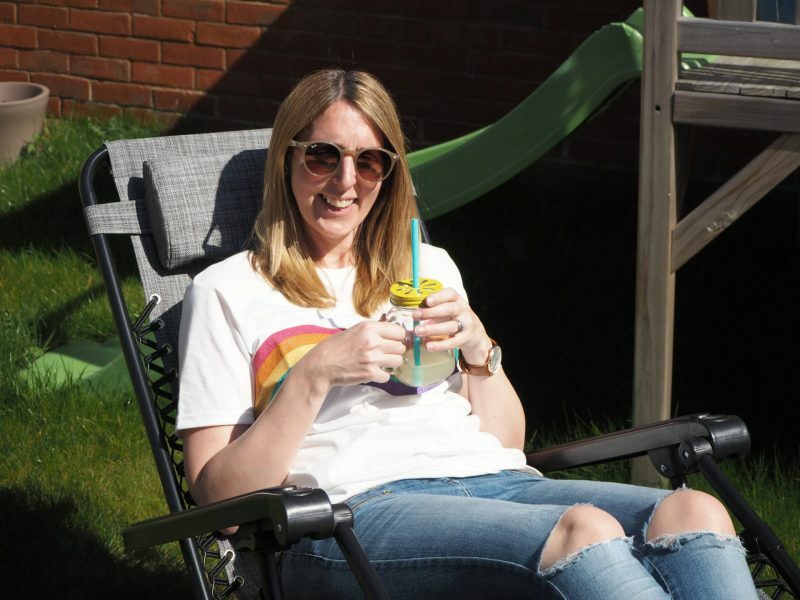 When we decided to move house, one of the things I loved about our house is that we can throw open the patio doors and the garden can feel like an extension to our home. The garden is a safe and fun environment for the girls to enjoy and also a place for me to relax. We’ve got to the point in the girls lives where they can play together and they don’t need me to constantly entertain them. This is the case even more when they are in the garden, the games and toys they have keep them more than happy for hours. One item that I’ve been wanting ready for this summer is a nice chair that I can relax in the garden. I’m trying to take better care of myself and make time to relax more. 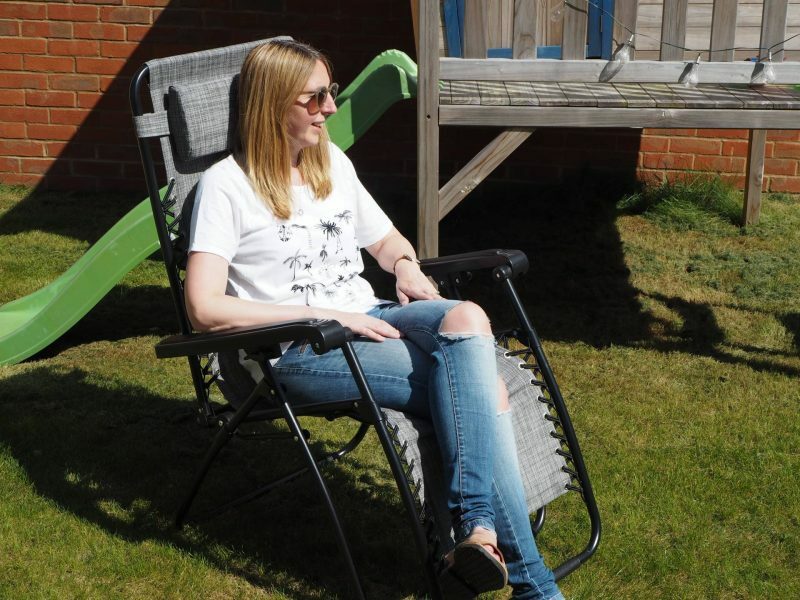 I was recently sent the VonHaus Textoline Zero Gravity Chair and it was exactly want I was looking for. In fact it was better. It is mainly just the girls and I that are out in the garden, with Andy at work, which means that I need a chair that I can easily carry myself out of the garage and into the garden. This chair is really light and because it is locked closed, it doesn’t spring open while your carrying it. When the girls are out in the garden playing, I need a chair that is mainly upright and I can easily see them. But I also want to be comfortable. This chair gives me both. With the added attachment of a pillow, gives me nice comfort for my head and I can position the chair in any position I want, from upright to fully reclining. The chair is big enough to allow for extra little people to come and snuggle with me and because it has a lock mechanism the chair can’t collapse if the girls try and pinch my chair and have a sit in it. The chair is really comfortable and I couldn’t be more happier with it. We had a few sunny days last week and I was able to use it a few times. Someone else also got to have a sit down in mummies chair. 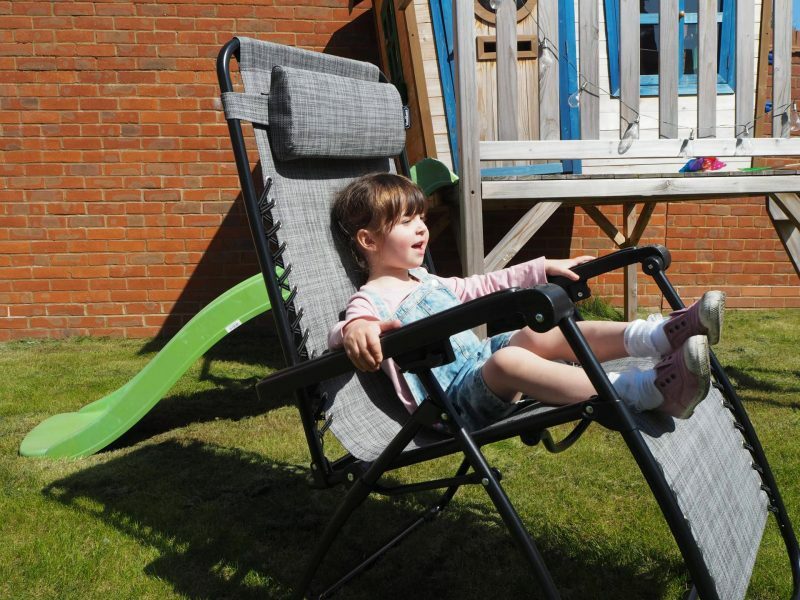 The Vonhaus Textoline Zero Gravity Chair RRP £34.99 and is available to buy from Amazon*. 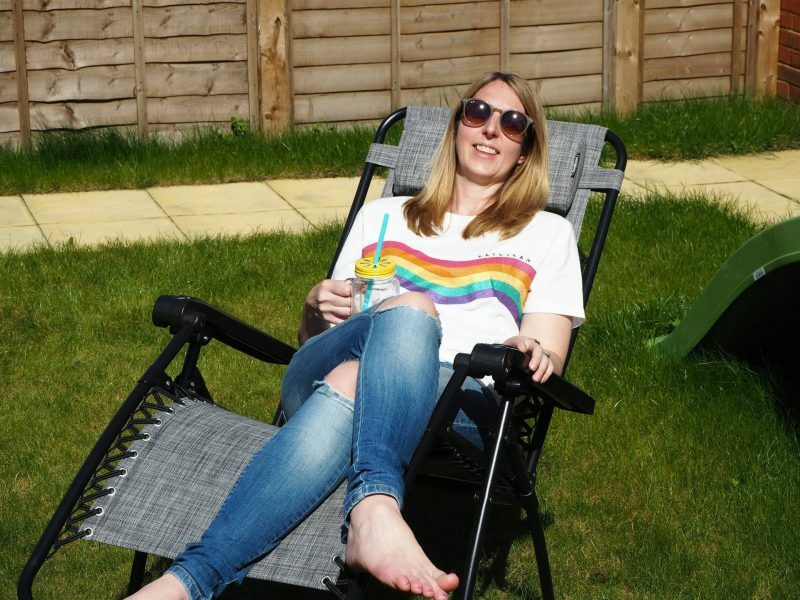 I’m really pleased with my chair and when the sunny days come along I will be straight outside relaxing in it. Disclosure: I was kindly sent my chair in return for an honest review. All views, opinions and photos are my own. Previous Post: « A Trip To Thorpe Park…Child Free! Ooh that looks amazing, just the name of it makes it sound comfortable! Hope you get lots of nice sunny days to enjoy it! Oh that looks really comfy, I would love one of these for the garden. Need to make the most of the sunshine when we get it! My parents have a set of these and they are so comfy, I really want to invest now we have our own garden. I love the extra safety features too! Ooh, I’m loving that chair. I always just sit on the camping chairs but they don’t recline so are a bit rubbish. This is exactly the sort of chair I was trying to describe to my husband a few days ago, it looks amazing. 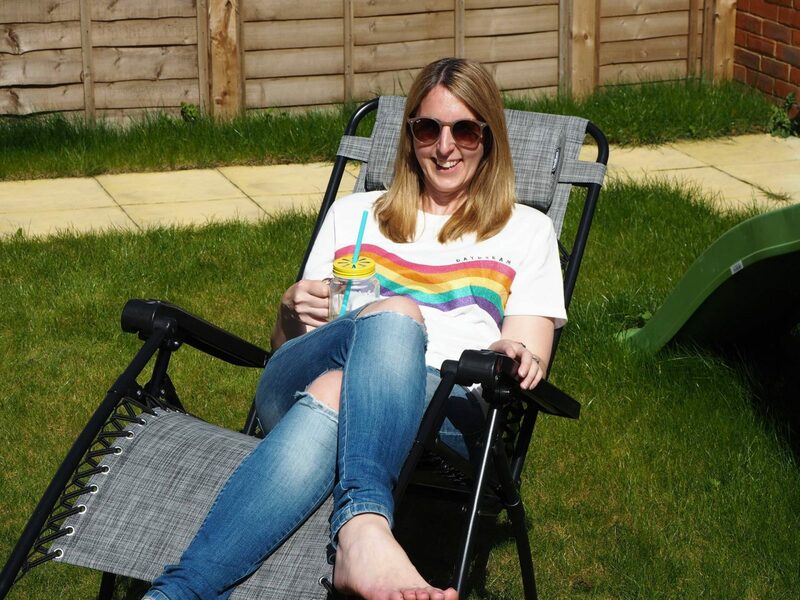 We have standard deck chairs and I would love something like this to celebrate rare few moments of Sun we get! I love the pillow too, that’s a nice little extra touch.